At the end of my last post in this series, we had added the lower cover and the hood limit switch, which didn’t feel like much progress. This post focuses on the control unit covers and power switch covering issues 48 – 51 of 3D Create and Print by Eaglemoss Technology. If you’ve skipped a part of this series you can start from the beginning, including details of the Vector 3 printer I’m building on my 3D printer page. At the end of my last post in this series, we had added the z-shaft support and top and side covers, giving all three axes attached to the main cover and covered. This post focuses on the lower covers and the hood limit switch covering issues 44 – 47 of 3D Create and Print by Eaglemoss Technology. If you’ve skipped a part of this series you can start from the beginning, including details of the Vector 3 printer I’m building on my 3D printer page. 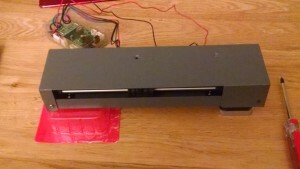 At the end of my last post in this series, we had completed the heater plate and sensors and reconnected the y-axis covers. This post focuses on the z-shaft support and top and side covers, covering issues 40 – 43 of 3D Create and Print by Eaglemoss Technology. If you’ve skipped a part of this series you can start from the beginning, including details of the Vector 3 printer I’m building on my 3D printer page. At the end of my last post in this series, we had attached the z-axis screw rod and made a start on the heater plate. This post focuses on the build plate, covering issues 36 – 39 of 3D Create and Print by Eaglemoss Technology. If you’ve skipped a part of this series you can start from the beginning, including details of the Vector 3 printer I’m building on my 3D printer page. This set of issues also needs the heater sensor part from issue 35. Unpacking this set of four gives two study plates that will form the build base and lots of interesting looking wires. At the end of my last post in this series, we had attached the z-axis motor and limit switch although hadn’t tested the action. This post looks at adding the z-axis screw rod and making a start on the heater plate, covering issues 32 – 35 of 3D Create and Print by Eaglemoss Technology. If you’ve skipped a part of this series you can start from the beginning, including details of the Vector 3 printer I’m building on my 3D printer page. Opening up this pack and seeing parts with “heater” in their description was quite exciting – I know there’s still a way to go but I can’t wait to get some filament threaded through to a heater and start trying out some of the many free designs included with the magazines. At the end of my last post in this series, we had started the z-axis assembly and had paused ahead of adding the second z-axis bearing. This post looks at adding the z-axis bearing, motor and limit switch, covering issues 28 to 31 of 3D Create and Print by Eaglemoss Technology. If you’ve skipped a part of this series you can start from the beginning, including details of the Vector 3 printer I’m building on my 3D printer page. At the end of my last post in this series, we had finished the x-axis assembly and successfully tested the motor. 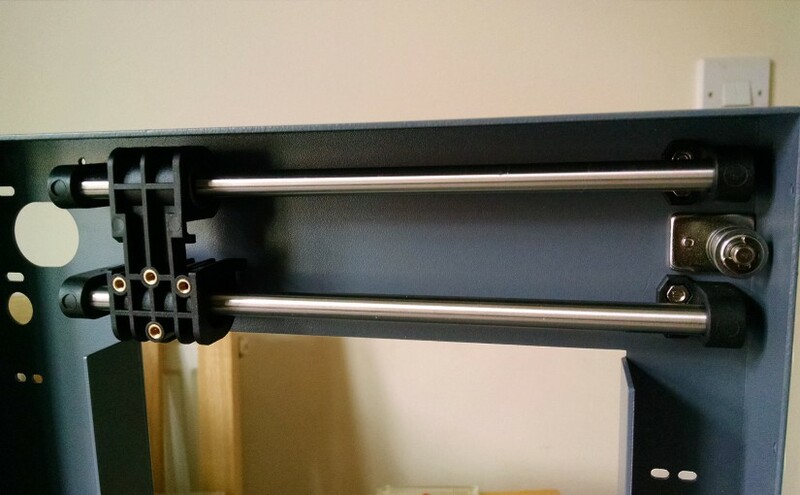 This post looks at adding the z-axis shafts and bearing, covering issues 24 to 27 of 3D Create and Print by Eaglemoss Technology. If you’ve skipped a part of this series you can start from the beginning, including details of the Vector 3 printer I’m building on my 3D printer page. At the end of my last post, we had started to build the x-axis assembly and got both shafts and the bearing block in place. This post looks at adding the timing belt and the x-axis motor, covering issues 20 to 23 of 3D Create and Print by Eaglemoss Technology. If you’ve skipped a part of this series you can start from the beginning, including details of the Vector 3 printer I’m building on my 3D printer page. You’ll need to dig out the motor test circuit board and AC adaptor to completed these steps and they are very similar to that for the y-axis so should be fairly quick for you to go through. If you’re a subscriber then this drop also comes with four packs of filament in different colours, which you’ll just have to keep somewhere safe until we’re in a position to use them. At the end of my last post, we had a completed y-axis and had also built the main frame of the printer, this post looks at building the x-axis assembly, covering issues 16 to 19 of 3D Create and Print by Eaglemoss Technology. If you’ve skipped a part of this series you can start from the beginning, including details of the Vector 3 printer I’m building on my 3D printer page. While this is mainly an exact copy of the steps that we undertook for the y-axis, we are working directly on the mainframe, which presents its own challenges. There are a few tips I suggest to make life a little easier for yourself, especially if you’ve been saving parts or have received several issues in the same drop. So, in my last post we completed the Y-axis motor assembly and tested it. Issues 11-15 of the 3D Create and Print magazine will see us add the cover and bracket for the y-axis and start on the printer plates and feet. If you’ve skipped a part of this series you can start from the beginning, including details of the Vector 3 printer I’m building on my 3D printer page. Y-axis cover: This is a fairly simple 3-bolt step. The only real gotchas here are to ensure that the cover is on the correct way round (so the slot in the cover is closest to the motor) and that the wires from the limit switch are not caught in any of the other parts and thread out through the slot. Yes there are only meant to be three bolts at this stage 🙂 This is also one of the first bad designs I’ve noticed – the y-axis could benefit from an extra clip to secure the limit switch wires because, now they are hidden, they could easily be too close the the motor belt and get worn down. Should the printer stop working, this will be one of the the first things I check.